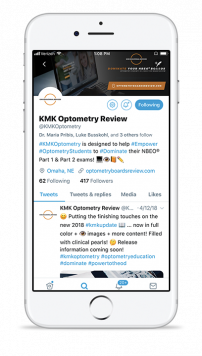 Stay connected to the world of #KMKOptometry through social media. Choose your preferred channel below and learn more about the features and ability to connect with KMK. We hope to see you on social soon! Test Your knowledge against Optometry students from all across the nation with KMK TYK. KMK Test Your Knowledge is a series of poll posts featured on Twitter®. Questions are curated by KMK's Chief Medical Editor, Dr. Kendra Dalton and posted for student responses. New TYK questions are posted twice a week and are LIVE for 24 hours. Follow @KMKOptometry on Twitter® to cast your answer choice. 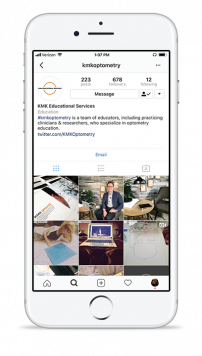 KMK Optometry on Instagram® is where all the Optometry students are. Get inside access to the KMK offices, new releases, resources and see student posts from all across the nation. Post a picture on Instagram® @KMKOptometry or tag us in your story for a KMK Shoutout or a shared post on our page! KMK Optometry on Facebook® is a great place to stay informed on all the latest resources available for students. 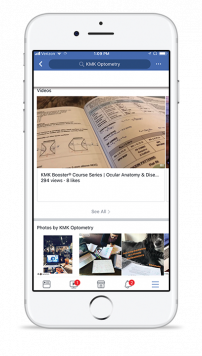 The KMK Optometry page features a ton of content including the KMK Facebook store, resources, video and more. KMK Optometry on Facebook has been the #1 KMK social media channel for ODs for years.